Gastropods are occasionally found, but never with their shells intact. These were commonly composed of aragonite, which is unstable compared to calcite, and decomposed after the animal died. 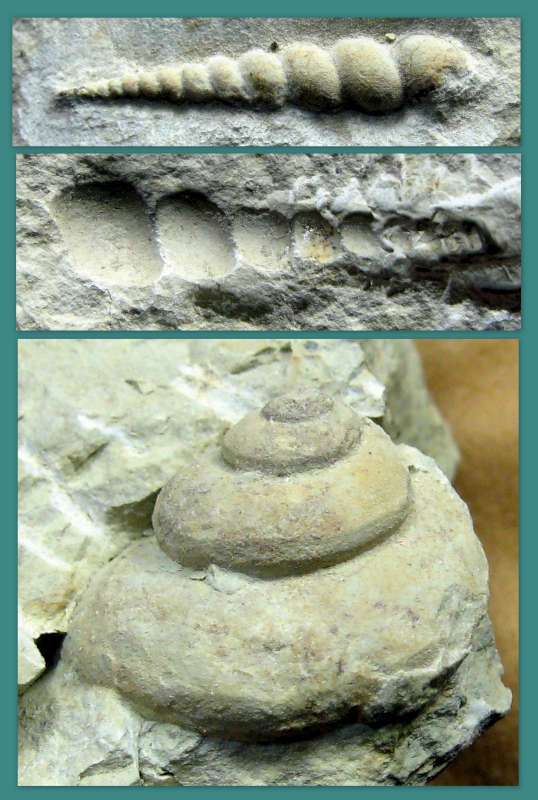 Before the shell disappeared, however, it filled with sediment, the results of which the viewer can see in the collage below. 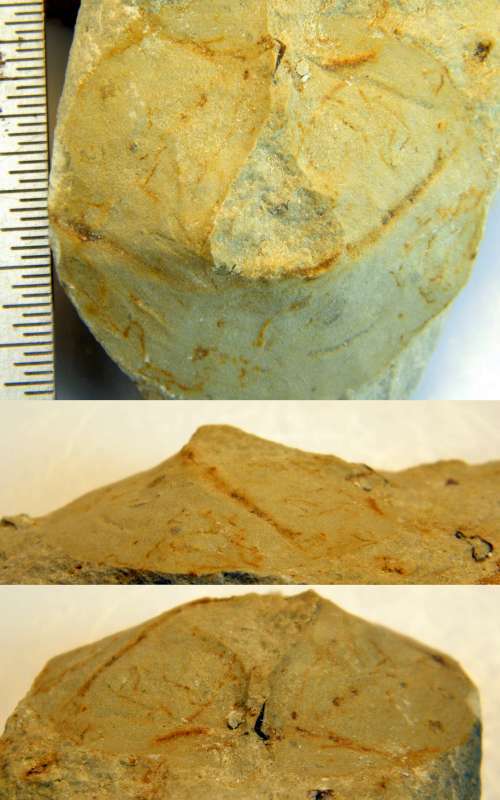 The next collage shows three aspects of an unusual fossil found occasionally at Black Cat Mountain. It may be the impression of a mollusk, so it is included here. More will be added later as the affinities and details of this strange formation are identified. Fairly common mollusks found on surface exposed rocks in the Haragan formation are the straight nautiloids or orthocone cephalopods. Typical surface exposed fragments of these pre-piscean predators suggest adult lengths attained a meter or more. 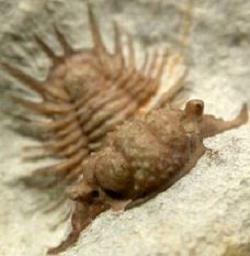 However, to find specimens as well as preserved as the one shown below, it is necessary to break rocks, and the viewer will notice they are typically rather small. It has been written that these cephalopods filled part of their shell cavities with calcium carbonate to balance themselves against bouyant forces caused by air filling in other chambers. This could have helped the animal maintain a near horizontal position in the water column relative to the sea floor. Notice the white and gray calcite crystals at the narrow end of the fossil. While its physical appearance might have resulted from recrystallization, an intentional calcite filling by the living animal could have provided an impetus for the material to be there in the first place. Photograph by G.P. Hansen. 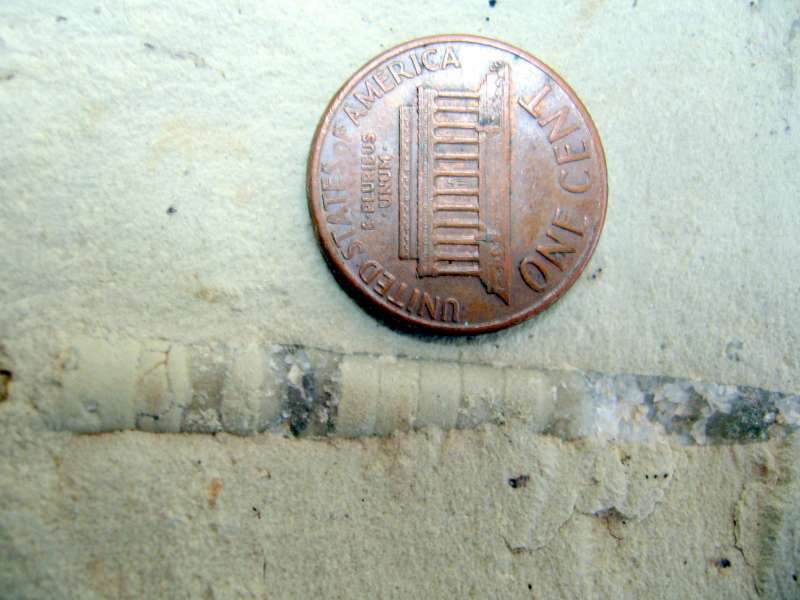 By comparison with the small, nearly complete specimen above, the large fragment (~13 inches long by 2-1/2 inches wide) found by Kevin Hopkins shown below must be from an individual that reached over six feet in length.